‘Fruit pretty large, of a pyramidal turbinate figure; about three inches and a quarter long, and two inches and three quarters in diameter. Eye large, and deeply hollowed. Stalk an inch long, rather thick, bent, inserted in a tolerably deep, oblique cavity. Skin smooth, green, with a few yellowish grey specks; as it becomes mature, it turns more yellow, and has sometimes a little colour on the sunny side. Flesh greenish white, very tender, and full of a saccharine, rich, highly-flavoured juice. In eating from November till January.’ [George Lindley – Orchard Guide p.397/1831]. ‘A highly esteemed pear of ancient and probably Belgian origin. Merlet mentions it in 1690 and La Quintinye in 1730.’ [Pears of New York p.341]. A very old pear from France, raised before 1690, at which time it was described by Merlet as the newest and rarest in France. [Gard. Chron. 1860]. Figured in Pomona Britannica [PB pl.LXXXII/1812] and Saint-Hilaire [pl.89/1828], the illustration used here. 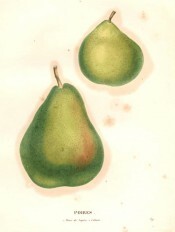 Listed in the 1845 catalogue as ‘Passe Colmar’, and in 1850 and 1857 as ‘Colmar’ [Pear no.12/1845]. These are different pears. It seems likely that ‘Colmar’ was intended but both have been included in the Hortus. There is no diary entry for this pear. Pear Colmar | Saint-Hilaire pl.89/1828 | BHL. Colmar is the large pear at the bottom.